Welcome to the Hashemite Kingdom of Jordan, one of the most interesting, safe and friendly countries not only in the Near East, but in the world. One can fall in love with the country at first sight. Amman is a unique mixture of modern and ancient, it is a center of arts and business. A wide range of first-class hotels, restaurants, shops, exhibitions and art galleries are to your service. Originally spread over seven hills like Rome, Amman now covers at least 14 hills on the hillsides on which white houses and villas are situated. 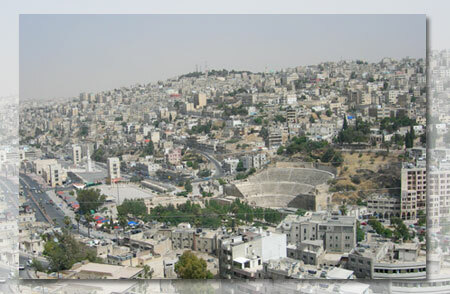 Amman is often referred to as “white city” because of outstanding whiteness of the limestone used in construction. Nearly half of the Jordan’s population lives in Amman due to the optimum economic and climate conditions. The night life of the city is wild and suggests a lot of cultural measures, rest in the modern restaurants and clubs. The inhabitants of Amman are glad to show tourists their beautiful city. Amman is the perfect starting point for traveling all over Jordan because it takes you no more than four hours to get to the capital from any part of the country. In Amman there is a traditional eastern market of Souk; it is situated in the center of the city. Here you can find everything you would like to buy in Jordan. Moreover, Souk is a museum in the open air. You will not get full impressions about country without visiting Amman. Even if you prefer sea-shore, spend one day in Amman and you will not regret. In the very heart of the Down Town there is a wonderful amphitheatre and ruins of the Roman Temple of Hercules (2nd century AD) left by the ancient Greek-Roman civilization. The Citadel neighbouring to pompous castle of the Governor (8th century AD) was left by the Byzantine age. Start out with the Citadel. Towering above downtown, the Citadel tells you about delightful history of the city and gives an opportunity to enjoy the magnificent view of Amman. Umayyad Palace Complex dates back to 720 AD. The building includes a monumental cruciform gateway with four vaulted chambers. A colonnaded street runs through the complex. Temple of Hercules was built in the reign of the Emperor Marcus Aurelius (161-180 AD). The Byzantine Church (6-7th century AD). The Corinthian columns mark the site. The Roman Theatre (2nd century AD) consists of three parts resting on the hillsides. Its seating capacity is about 6 000. The theatre is now used for special events and performances. The Roman Forum was the place for people to gather and discuss their problems. Next to the Theatre (or Odeon), there was one of the biggest forums in the Roman Empire (100 * 50 meters). The columns opposite the Theatre are the part of the colonnade round the Forum. Nymphaeum. The Roman settlements were always decorated with gardens and public fountain. The chief fountain (2nd century AD) is situated next to the Theatre complex. The King Hussein Mosque is made of pink and white stones. The Ottoman-style mosque was rebuilt in 1924 on the site of the ancient mosque by Emir Abdullah. The mosque was restored in 1987 when King Hussein ruled. Petra, the pearl of Jordan, is the most amazing place of the Near East. At night July 7, 2007 in Lisbon at the ceremony there were announced the results of the contest “New Seven Wonders of the World”. 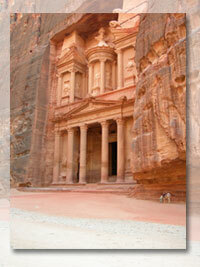 The most famous Jordanian sightseeing – Petra – is one of the wonders of the world. The unique architectural constructions built by unknown ancient masters were well preserved till now due to the fact that they were carved out of solid rock. Today it is the most striking historical monument. Petra is the part of the cultural heritage of the ancient Nabataeans, the industrious Arabic tribe which lived in Jordan more than 2000 years ago. The Nabataean Empire existed for many centuries during which Petra was famous for its culture and architecture. But Petra knew the period of decline and destruction. The Nabataean Empire was conquered by Roman Emperor Trojan, and some time later the Roman Empire collapsed. By the 14th century AD the territory of the Nabataean Empire, including Petra, was absolutely neglected and forgotten. Only in 1812 Petra was reopened. The Swiss explore named Johan Ludwig Burckhardt being in the suburbs of Petra persuaded his guide to show him the lost mysterious city about which there were a lot of legends. He wrote in his secret diary: “Probably, the ruins of Wadi Mousa are the remains of ancient Petra”. The road leading to the city lies in the deep and narrow gorge of the Sig. It is a cleft in the rock appeared as the result of the earthquake. The path winds between the rocks. Here one can notice the remains of the road which dates back to the Nabataean and Roman ages. Here and there the trees and bushes grow from the rocks, it is amazing. The remains of the ancient magic bas-reliefs and gauges for ancient water tubes remind about wonderful people – the Nabataeans who created all these things. The gorge is 1200 meters long and nearly 80 meters tall. Traveling along the gorge one feels like Indiana Jones looking for the Holy Grail. Do not be quick! 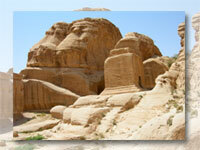 Enjoy the interesting sculptures, wonderful Petra rocks, their multicolourness and quaint forms. The Sig exit is the most gripping place because it suddenly opens upon the most impressive of all Petra’s monuments – Al-Khazneh (“The Treasure”). Its façade is famous due to the film “Indiana Jones and the Last Crusade”. The building is 30 meters wide and 43 meters tall. It was thought to be at first the place where one of the Nabataean kings was buried. Later it serves as a temple and treasure-house. The elegant constructer of its facade obliges us to bend our heads before the ancient builders. In Petra one can observe a lot of sights. It is better to look round the city in the early morning or before sunset when the sun dissolves in the colours of the pink stones giving additional depth to all the tints. 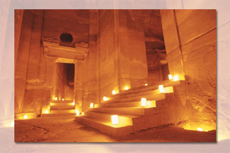 If you have an opportunity to spend several days in Petra, you should take part in the excursion “Petra at night”. It takes place after sunset. You will reach “Al-Khazneh” through the gorge and enjoy the unforgettable Bedouin music. The impressions of the city in a light of 1800 candles will remain in your heart forever. The excursions take place thrice a week (Monday, Wednesday, and Thursday) from 8:30 p.m. till 10:00 p.m.
Petra is not only the Nabataeans. It takes you 15 minutes to get from Petra to the ancient settlements of Buda and Basta, the ruins of the Roman fortress in Uzrah. Being in Petra one can feel the breath of the centuries, admire the masterpieces of the ancient artists, get to know how people lived 10 000 years ago. Al-Deir (“The Monastery”). 800 steps lead to the monastery. due to its right to control the eastern trade route from Egypt and Arabia to Persia and the Mediterranean. Jerash was Emperor Hadrian’s favorite city. Due to this fact the city achieved great prosperity. 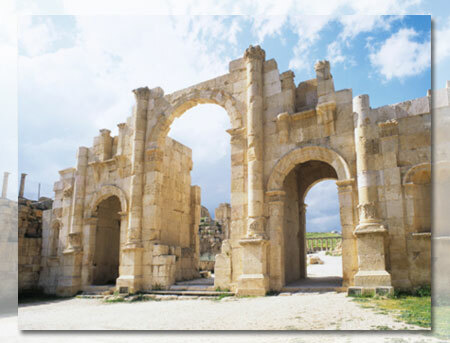 By the 3d century AD there was the rapid decline of Jerash when it became a Christian city. Jerash is a perfect sample of the traditional Roman architecture of the Middle East. Here one can see Zeus temple, Artemis temple, Hadrian’s Arch, a lot of Roman baths, three theatres, temples, hippodrome, squares, fountains; also one can walk along the streets. Located west of Jerash, Ajloun castle is one more Jordanian treasure. One can get there walking along the road through the pine forest and olive grove. 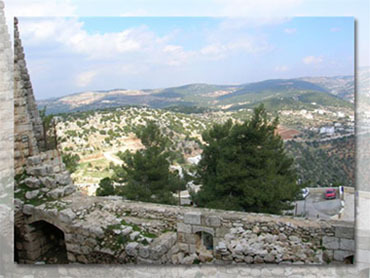 Towering on the mountain peak, the castle was built in 1184 by one of Saladin’s generals to control the road between Syria and Jordan and to protect Ajloun from the Crusaders. The castle is almost opposite the castle of Belvoir on the other side of the Jordan. Originally it was a square castle with a tower at each corner. Under the Mamelukes, Ajloun was one in the chain of castles using heliograph and pigeon post could transmit messages from Damascus to Cairo within twelve hours. It was severely damaged by earthquakes in the 18th century and at the beginning of the 20th century, and restoration work is proceeding. The entrance to the castle is still there and the castle is entered over a modern bridge. The interior is full of rambling corridors and staircases. Notice the “murder holes” in the walls, through which boiling oil or pitch could be poured on any invaders. From the castle there is an impressive view over the cultivated terraces nearby. This part of Jordan is one of the most fertile regions. The Ajloun Mountains are famous for their rich greenery and thick forests with the perfect opportunity for the tourists to have a walking tour. Gadara (Umm Qais) is one of the Decapolis ancient cities. 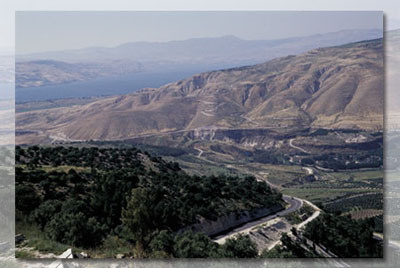 It is situated on a high hill above the Sea of Galilee and the Galilee countryside. 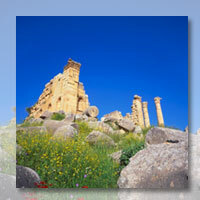 Umm Qais is nearly one hour journey from the town of Irbid and two hours from the city of Amman. Umm Qais is famous as the place where Jesus Christ cured two man possessed with devils by forcing the demonic spirits to enter a herd of pigs. This story is told in the Bible: “And when He had come to the other side, to the country of the Gergesenes, there met Him two demon-possessed men, coming out of the tombs, exceedingly fierce, so that no one could pass that way. And suddenly they cried out, saying, “What have we to do with You, Jesus, You Son of God? Have You come here to torment us before time?” Now a good way off from them there was a herb of many swine feeding. So the demons begged Him, saying, “If You cast us out, permit us to go away into the herb of swine”. And He said to them, “Go”. So when they had come out, the went into the herb of swine. And suddenly the whole herb of swine ran violently down the steep place into the sea, and perished in the water” (Matthew. Chapter 8, 28). In 323 BC after the death of Alexander the Great the Egyptian dynasty of Ptolemaic found the city and soon it became a fortress on the border against the Seleucids. 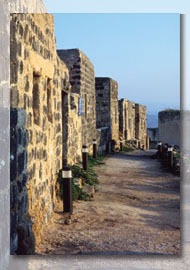 Today one can observe the ruins of the gates, colonnade which suggests the wealth of ancient Gadara. Early Gadara was an important cultural centre, a place for the Romans to have a rest and healing. In the 2nd century AD the city reached its prosperity when Emperor Trojan united all parts of the region. This age had an impact on the cultural life of the city. Here the great ancient writers, poets and philosophers lived. 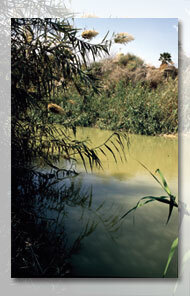 Several sites referring to as “Bethany beyond the Jordan” have been proposed for the location of John’s baptizing. The site of John the Baptizer’s settlement at Bethany beyond the Jordan where Jesus was baptized has long been known from the Bible. But there was no evidence of the definite place. In the works of the early Christian pilgrims the Greek column with cross on the top was mentioned. The column symbolizing the place of baptizing was erected during the early Christian age. In 1996 the International Archeological group announced that they succeeded in identifying the site on the east bank of the Jordan. They found the foundation of the column. It was 40 meters east of the Jordan. In 2000 when the Pope visited Jordan the latter was declared to be the Holy Land where Jesus was baptized. Since that time there was a lot of reconstructions. The road for pedestrians, two restaurants, VIP-hall and travel agency appeared. Here one can also observe the ancient churches, John’s spring, the monkish cells, the places connected with Mary the Egyptian, the hill from which Elijah the Prophet was taken to the heavens. Archeologists found here the remains of three churches named in honour of John the Baptizer, and next to them the remains of the church built by Emperor Anastasias. On the river bank a new Orthodox church is built. Now people from all over the world come here to be baptized. In January, 2007 King of Jordan Abdullah II presented one hectare of land on the holy bank of the Jordan to the Russian Orthodox Church. A temple and hostel for pilgrims will be erected here. Tel Al-Harrar (Elijah’s Hill). Here one can observe the ruins of the ancient Byzantine monastery with churches, a big font and water-supply system. Building referred to as “praying” (3d century AD). It is the most ancient Christian temple in the world. “Then Moses went up from the plains of Moab to Mount Nebo, to the top of Pisgah, which is across from Jericho. And the Lord showed him all the land of Gilead as far as Dan, all Naphtali and the land of Ephraim and Manasseh, all the land of Judah as far as the Western Sea, the South, and the plain of the Valley of Jericho, the city of palm trees, as far as Zoar” (Deuteronomy 33:13). Moses is considered to die and be buried here, but the definite place of his burial is unknown. Mount Nebo is the highest point of the district. From here you can observe the Jordan Valley, the Jewish Mountains, the Dead Sea and Jerusalem. 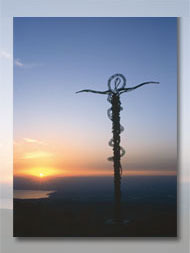 The first Christians used Mount Nebo as a place for pilgrims. The first church in honour of Moses’s death was built here (6th century AD). 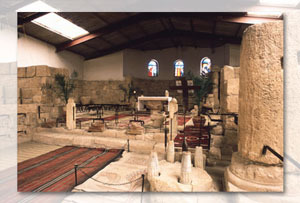 Today rebuilt by St. Fransisk Archeological Institute, it is the most important place for pilgrim’s tours. Opposite Moses Temple there is Moses’s Crosier, symbolizing the snake erected by Moses in the desert and the Cross on which Jesus Christ died. Mount Nebo, Bethany beyond the Jordan, Mukavir, Tel-Mar Elijah and Anjara are the places for pilgrimage; it was announced by the Catholic Church of the Near East. Madaba and its suburbs are mentioned in the Bible as Medeva. 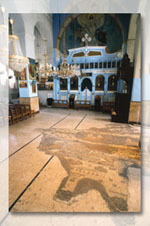 It is famous for its mosaic map of the Holy Land and Jerusalem in St. George Church. The map is the most ancient one (6th century AD). 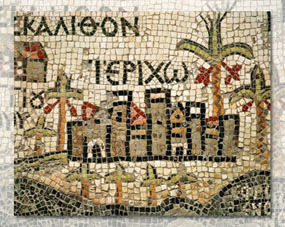 Madaba is known as “the city of mosaics”. Many mosaics are kept in Madaba Archeological Park. Here one can observe the most ancient mosaic of Jordan (1st century BC). Other mosaics can be observed in the churches of the city. Madaba is forty five minutes journey from Amman. 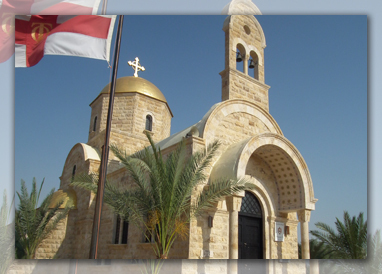 As a rule, Madaba is a part of a one-day tour including a visit to Mount Nebo and Bethany beyond the Jordan. 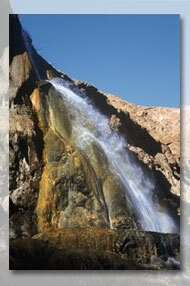 Main is a place with the hot mineral springs. To get there one should go down the serpentine road to the big canyon. From above the beautiful views of the Dead Sea and canyon are opened. Retiring from fuss here one can enjoy calmness and silence. 2000 years ago the ancient historian Flavius wrote that King Herod frequented the springs and found the physical and moral cure here. Hammamat Main has been enjoyed for therapeutic and leisure pursuits for thousand years. It is very pleasant to visit the hot springs in winter, especially if you suffer from rheumatism, arthritis, diseases of digestion and blood vessel system. Here the five-star hotel EVASON MA`IN & SIX SENSES SPA with swimming-bath, swimming-pool, and sport facilities is available. Next to the hotel there is a sanitary hospital with special baths, inhalers, thermal and physical therapy. All treatments are taken under control of the medical staff. Main is 25 km journey from Madaba and 30 minutes journey from the Dead Sea. It is convenient to visit Main when one has a rest on the Dead Sea shore. The Caliph Desert castles are most interesting sights of Jordan. United under the name of “Desert castles”, these complexes served different purposes: as residences, fortresses, hunting lodges, caravanserais, agricultural and trading complexes. As the architectural peculiarities suggest, the castles were built mostly under the Umayyad (661-750 AD). These complexes include 30 castles: Al-Muwaggar, Al-Qastal, Azraf Fort, Hamman Assarah, Mushatta, Qasr Al-Hallabat, Qasr Kharaneh, Qasr Tuba, Qusayr Amra and others. Many centuries ago they were smothered in green gardens irrigated by original system the part of which one can observe now. In Qusayr Amra there are very interesting frescos. The castle is protected by UNESKO. The frescos depicting human beings and animals which is unusual for the Muslim culture surprise you greatly. 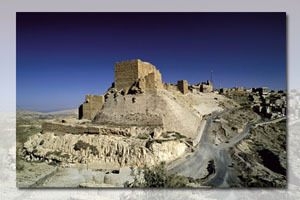 In Roman times the black basalt fort of Azraf served as a stronghold. One can get the Desert castles going east of Amman. One day is enough to look round the castles. The castles of Karak and Shobak are the bright reminders of knightly times, a perfect sample of architectural and military genius. Karak is situated on a hilltop about 1000 meters above sea level. Built in 1136, it is a dark labyrinth with the galleries and endless passages. The Crusaders had possessed the castle till 1183 when Saladin captured it. The most famous owner of Karak was Raynald of Chatillon, a cruel person. After Baldwin’s death his 13-year-old son sought peace with Saladin. Soon the young king died, and the new owner Raynald declared war. Saladin was ready to fight. These events were brightly described in film “Divine realm”. The battle left Saladin with many prisoners. Most prominent among them was Raynald. Soon he had his head cut off. 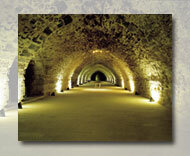 The huge galleries, endless passages impress visitors greatly. Shobak is one more reminder of the Crusaders’ glory. 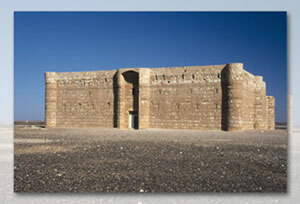 Despite the huge fortification Shobak was taken by Saladin’s troops 75 years later after it had been built. One of the castle’s name was “Montreal” and as a result it has some elements of the European style. No doubt, those who are interested in the Crusaders’ history will visit Karak and Shobak. One can get the castles going south of Amman. It is possible to visit Korak and Shobak on the way to Petra. “Vast, echoing and god-like …” Such words were said by Lawrence about Wadi Rum. Among the sand dunes there are purple-brown mountains changing their colour according to position of the sun. The landscapes of Wadi Rum are not comparable to anything else that is why its second name is “Moon Valley”. The main sight of Wadi Rum is Its Magesty the Desert with colourful hills above the smooth goldish-pink surface. At the beginning of the last century Wadi Rum was connected with the British officer T.E.Lawrence and Prince Feisal Hussein. Much of David Lean’s “Lawrence of Arabia” was filmed in Wadi Rum. The lonely rocks attract efficient mountaineers. Some of the peaks are 1750 meters high, so only skillful sportsmen can reach them. Those who prefer hiking enjoy exciting walking roots. They explore endless desert, canyons and other secrets of nature. The majority of tourists prefer to take 2-hour safari jeep travel. You visit the spring of Lawrence of Arabia, the mountain known as “seven pillars of wisdom”, observe ancient rock pictures, enjoy the sunset in the desert. Then you have an unforgettable supper with Bedouins, sing songs, and dance at the fire. Do not forget to take warm clothes, for there is difference between the day temperature and the night one (from 32oC to 4oC). Wadi Rum becomes most beautiful in spring when after rains the desert turns green like a soft carpet. Red anemones, poppies, black irises (the national emblem of Jordan) grew everywhere. Wadi Rum is nearly one hour journey from Aqaba (going north from the city). It takes you 4 hours to get from Amman to Wadi Rum (going south from the capital). Azrak is a unique reserve with water-marsh areas. It is located in the east of Jordan. Azrak is one of the Jordanian Royal Nature Protect Society. Here one can observe natural and artificial ponds. A lot of birds of passage stay here to have a rest on the way from Asia to Africa. Many birds live in Azrak.The best season to visit Azrak is late autumn, winter or early spring. In the reserve after winter rains there are a lot of ponds attractive to the great amount of the birds of passage. Azrak is a great discovery for those who are fond of observing birds. 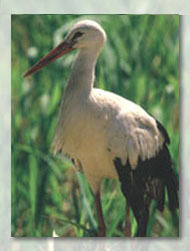 The reserve of Shaumari is the centre of breeding rare and disappearing animals. Here you can observe Arabian oricks, ostriches, onagers and gracious desert gazelles. The animals are out of danger and their population constantly rises. Nobody hunts for them. The reserve of Shaumari is famous for diversity of desert flowers. One can observe wild fauna from the special tower. 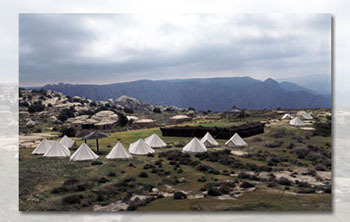 The reserve of Mujib is situated in the picturesque canyon of Wadi Mujib. In the east the reserve borders on the mountains of Karak and Madaba. They are 900 meters high above sea level. The difference between the heights in the reserve is 1300 meters. The scientists have discovered here 420 species of plants, 10 species of animals, 102 species of birds. The researches have not been finished yet. In the reserve The Royal Society for the Conservation of Nature offers everybody bicycle tours with guides. Within the tours one can visit the Dead Sea, biostations where it is possible to observe ibexes, the canyon, to cross the rivers and bathe. 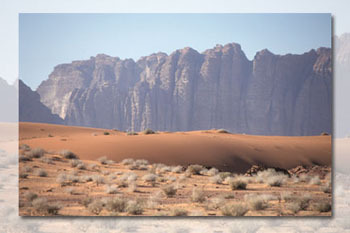 The reserve of Dana has three entrances: above and under Wadi Rum. One of the entrances is at the territory of Dana village. Here you are met in the special House of Guests. 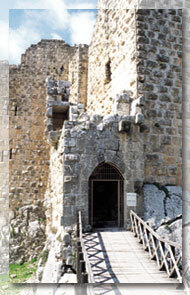 The second entrance (Tower Centre) is not far from Dana, in the settlement of Rammana. Rammana looks like a combination of encampment and resort place erected specially for nature lovers. The third entrance is at the foot of the mountain of Feinan. It resembles the settlement of Rammana. 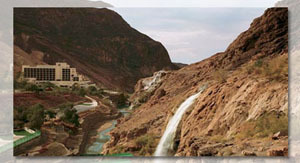 One can get Wadi Mujib going along the motor way the Dead Sea – Aqaba. It takes you nearly an hour and a half to get there. One can get Dana going from Amman in the direction of Karak and Tafila. Not far from Tafila there are two roads: one of them to Rammana, another one to Dana. The reserves of Azrak and Shaumari are nearly 2 hours journey from Amman. The Dead Sea is a unique natural monument and health resort. It is the most salt lake in the world (410 meters below sea level). It is eight times saltier than the Atlantic Ocean and forty times saltier than the Baltic Sea. The Dead Sea water is very “dense” and looks like a thick oil brine. 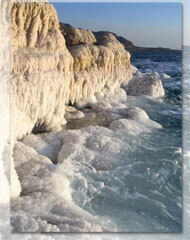 Healthy characteristics of the Dead Sea salt and mud were known even in ancient times. The ancient Greeks and Romans built here health resorts. Cleopatra realizing the benefit of minerals used them in cosmetology. Mark Antony conquered the territory of the Dead Sea especially for her. While salt in the water of most seas is 77% sodium chloride, the Dead Sea salt is 25-30% sodium chloride, 50% magnesium chloride; the amount of bromide is eighty times higher than in the Atlantic Ocean. The water contains copper, zinc, cobalt and so on. There is no life in the Dead Sea. There is neither fish, nor water plants so the ancient Greeks called it “the Dead Sea”. The density of the water is so high that one can not drown. You should take a shower after visiting the Dead Sea. Bathing in it you will be cured of many diseases. The air here is dry, clean, without dust and with a high concentration of bromide. The atmospheric pressure is 800 mercuries. It is very useful for your health. Moreover, the sun rays are filtered in the air, and water evaporations work as a filter. Due to it ultra-violet is weak, it is ideal for heliotherapy. The minerals rich your body cells with oxygen, take out toxins; the skin is moistened. So, your skin becomes more elastic, an amount of wrinkles decreases and you can cure a lot of diseases. The Dead Sea has its own destiny rich in historical and cultural events. Many centuries ago here there were five settlements mentioned in the Bible: Sodom, Gomorrah, Admah, Zeboim and Zoar (Bela). Today the eastern part of the Dead Sea is sparsely populated. The landscapes have changed a little since ancient times; it makes them attractive for tourists. The Dead Sea is forty minutes journey from Amman. 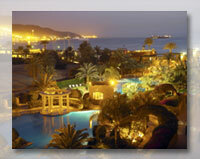 Aqaba is a famous Jordanian window to the sea. The resort offers perfect sand beaches for the family rest, beautiful coral reefs for diving. Petra and Wadi Rum are next to Aqaba and it makes the place very interesting for tourists. Aqaba is a charming place. It is a small world of unique historical monuments, perfect hotels, excellent opportunities for shopping and hospitable, friendly people. But the main sightseeing of Aqaba is the Red Sea. The temperate climate and mild sea currents form an ideal environment for coral reefs, marine flora and fauna. The water is perfectly clear which provides ideal conditions for illumination. One can feel pleasant freshness even in the hottest season of the year due to constant breeze. Aqaba is proud of organizing day and night diving in the reef zone of the Red Sea. Besides, every hotel helps you to organize sea fishing, traveling in boat with transparent bottom and other entertainments. In five-star hotels diverse excursions on the ships, interesting journeys to the Egyptian islands of Pharaoh wait for you. The eternal rich life of the reefs amazes. Thickets are mixed with sea anemones above which there are different bright fishes: blennies, anemone fish, hump head fish, bullheads, needle-fish and thousands and thousands of others. 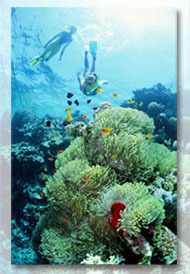 There are several diving centers in Aqaba. They provide sound diving equipment, efficient instructors and boats. Those who want to see the miracles of the marine bottom can rent a boat with transparent bottom. For nine months the water in Aqaba is ideal; only in summer it is very hot. But even in summer a lot of tourists visit the place to have a rest walking, bathing and entertaining 24 / 7. Aqaba is four hours journey from Amman if you use the Desert Highway and five hours journey if you use the Royal Highway.